The original name is ” Walled off ” Hotel. Its owner is none other than Bansky the” graffiti ” artist, who set his sights on the West Bank and especially on the separation wall of Bethlehem to make a work of art. Oddly enough the name reminds us of another luxury hotel on the other side of the wall, the ” Waldorf Astoria Hotel”, which was built recently in Jerusalem. 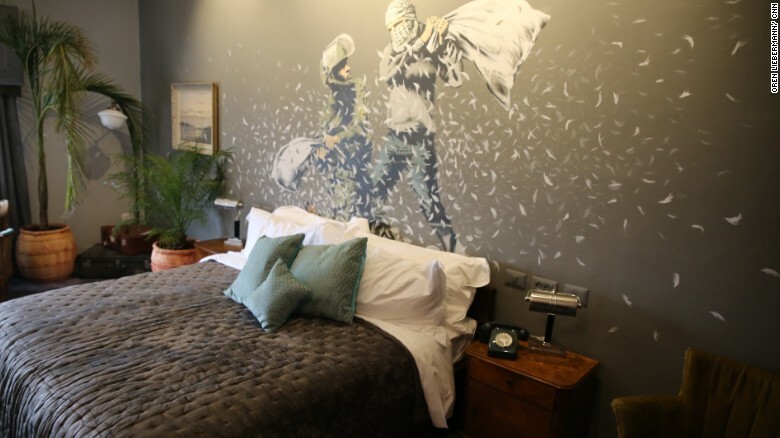 Its ten rooms are decorated with Bansky arts, furnished with taste, humor, research and provocation. Very little light penetrates. The view, certainly the worst of all hotels all over the world, overlooks this famous wall of separation. Numerous graffitis parade this wall and continue to recall the years of Intifada, the Israeli- Palestinian conflict, nowadays an entrenched population that lives with a feeling of abandonment and isolation while being administered by the ” Palestinian Authority”. This entry was posted in Bansky, Bethlehem, graffitis, Non classé, Palestinian authority, room, separation wall, Walled off, work of art and tagged art street, israeli-palestinien conflict, west bank on 25 June 2017 by Nicole Samuel Israel Guide.